The heavens gained several stars this year as classic film stars passed away in 2012. Since Comet Over Hollywood did not give several of them the full attention they deserved, the first few days of 2013 will be dedicated to some of the notable celebrities who left us. 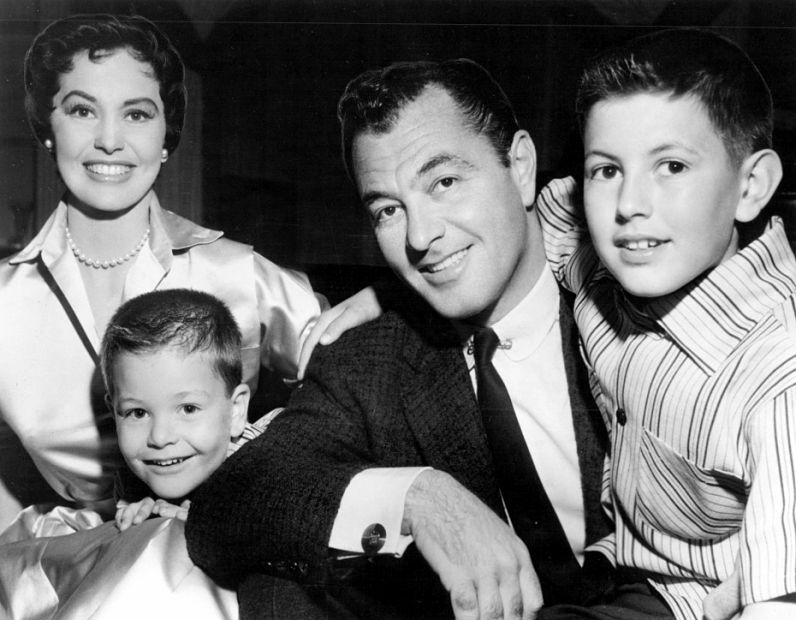 Tony Martin with wife of 60 years, Cyd Charisse, and children Tony Jr. and Nicky in 1956. Hedy Lamarr, Esther Williams, Rita Hayworth. He romanced and was married to the most beautiful women in the movies. 1940s and 1950s crooner Tony Martin had a smooth voice that could be compared to melted butter, or what his friend Gabriel Guerrero described as “butterscotch,” in a USA Today article. Martin’s career began on the “Lucky Strike Radio Hour” during the 1930s and moved on the Gracie Allen and George Burns Show. 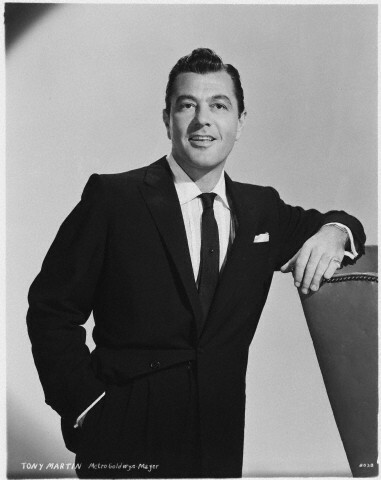 He began his film career at RKO in the late 1930s but was more successful when he moved to MGM, performing in movies like “Ziegfeld Girl” (1941), “Easy to Love” (1953) and “Hit the Deck” (1955). But his most successful endeavor was his marriage to dancer and actress, Cyd Charisse in 1948. 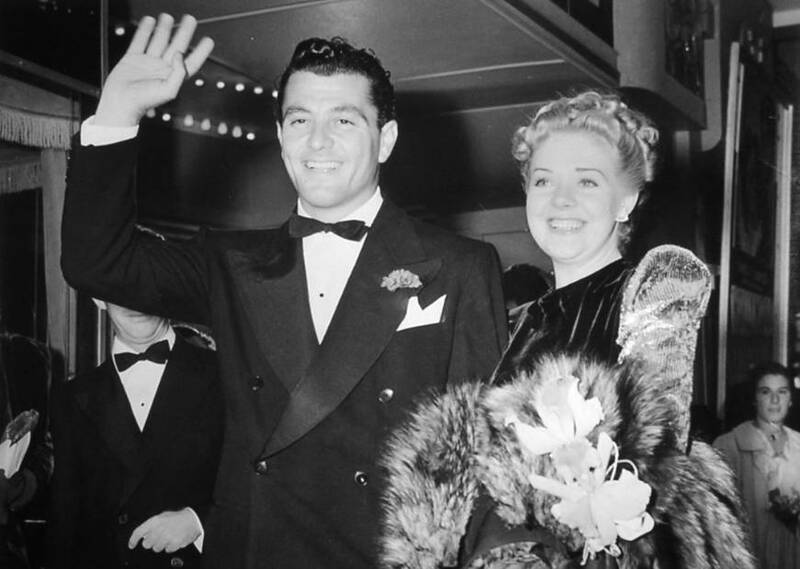 Martin was first married to actress and singer, Alice Faye. Faye and Martin met while filming “Sing, Baby, Sing” in 1937, according to a New York Times Article. They married in 1937 and were divorced by 1941. Faye was 20th Century Fox’s top star and her fame interfered with their marriage. “To many people around town, I was Mr. Alice Faye,” Martin said. But his marriage to Cyd Charisse lasted for 60 years until her death in 2008. The couple met while Charisse’s fame was still growing at MGM. Charisse and Martin had one child together, Tony Jr., along with her son Nicky from a previous marriage. “She stepped out of a dream,” Martin said about Cyd. The two never starred in any films together, aside from a brief cameo Charisse makes at the end of “Easy to Love,” but the couple performed in singing and dancing tours in their later years, according to a USA Today article. “To him, walking out on to a nightclub floor is as simple and natural as going to the kitchen for a glass of water,” Charisse said in “The Two of Us,” the joint autobiography she wrote with Martin in 1976. Martin passed away on July 27, 2012, at the age of 98. But even well into his 90’s, he was still performing and his voice was just as rich.